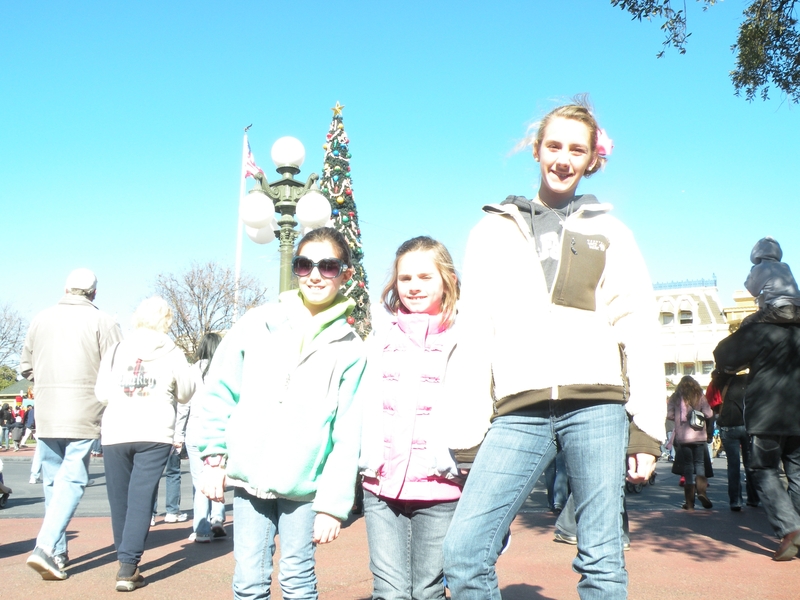 All three girls, my parents and I went to the bathroom at approximately 11:15 AM on January 1 before we pulled out of the driveway for our eight hour junket to Florida. Before noon, we had stopped once for a bathroom break. DJ had a sick stomach, and the man I had admired for years for the size of his bladder had taken this opportunity, “just in case.” Not only did we stop for him in the Tar Heel state, we also visited rest stops in the Palmetto State, the Peach State and the Sunshine State. I had embarked on a five day journey where the focus of our trip would not be on which attractions we would see at Walt Disney World, but on where we could find the closest bathroom. My mother’s bladder is the size of a garden pea. They say I have my father’s nose and jaw line. I have my mom’s eyes and urological functions. For years on vacation my mother and I would plead for stops while my older brother and father would roll their eyes, with bladders the size of camels’ humps. My, my, how the tables have turned. It did not matter who in the family needed to relieve themselves, my dad joined right in. I suggested he owed my mother and me an apology for years of urination ridicule. He blamed old age and refused to atone for the past. When we booked the trip, I expected my mother to go…and go…and go. That was no surprise. What I’d forgotten is the length of time each visit would take. My daughters explained that when their grandmother approaches an unfamiliar potty, she meticulously wipes it down. She then wraps the seat, double ply, with toilet paper to ensure that her epidermis does not touch the unknown surface. Because she is cold natured, she wears a sweater in July mid-day on the beach, imagine the layers of clothing that had to be removed in January in order to proceed with elimination. I’m not sure what she was wearing on the bottom, but on the top she had a camisole, a t-shirt, a shirt, a sweater, a vest and a white Pillsbury Dough Boyish puffy coat. Children approached her at the Magic Kingdom asking for her autograph. They thought she was a character. To enter Disney World, you hold your Magic Band, a Fit-Bit type bracelet, up to a monitor and then scan your fingerprint to gain admittance into the park. Time and again, my mother’s Magic Band would work, but the monitor could not detect her fingerprint. My dad said it is because she washed them off. The final ritual of her bathroom experience is a full scrub down of any potentially exposed areas of her body. I have never seen it, but I think she washes her hands, legs and sometimes her hair (depending upon the overall cleanliness of the stall) after each visit. If you washed your hands 27 times a day, 432,525 days in a row, you would be devoid fingerprints too. It actually worked fine because the girls and I could wait in line AND ride the more adventurous attractions in about the same amount of time it took her to go to the restroom. We actually had a lovely vacation, and, we visited bathrooms from around the world. Where did the hovercraft go? How sweet it would be to vacation without any concern for money. In my life, we rely on grandparents for the really big stuff. And if they don’t come through, it’s ugly. Lisa once told me she wasn’t going to spend thousands of dollars going to Disney World and then spend the whole week listening to me moan about every Diet Coke she ordered. I don’t think I really moaned. I was just thinking about sending the kids to college. “So, you gonna order another Diet Coke?” or would you prefer we send DJ to college? This past trip, we lucked up. My brother-in-law, Matt, has a cousin who works in the park. She hooked us up! A MAJOR discount for ahhh, well, extended family. Very extended. I mean, didn’t we all come from Adam and Eve? We Just got back from Disney World – went there for DJ’s spring break. Of course you probably already know that. Based on the crowds I’m assuming you were there too. Not only do I get a kick out of all the attractions in the parks, I was also quite amused by watching all the other suckers spending $5 on an 8 oz soda. One thing that really struck me on this trip was the lack of happiness I saw in some of the families I encountered. I’ve heard that this mouse mecca is the happiest place on earth. Apparently that is not the case for all. In the Orlando airport I saw one family with four boys. They should have stopped with one. The mother went absolutely nuts on two of her kids as they were approaching the Disney Magical Express, the bus that transports you to this Orlandon Garden of Eden. “Stop asking questions,” she snipped! “I’ve had it with you all!” Her tone was ferocious. I glanced at her poor husband. He looked like she’d had him for lunch a couple of times too. I wanted to go take up for the fellas, pondering what I might say. I refrained. I’m not sure why. Another woman entered a different bus with her three-year oldish son. They sat down a few rows behind me. “Where’s your jacket?” she asked alarmed, her voice loud enough for us all to clearly hear. There was silence, and then his tears began. I was floored. The boy couldn’t have been four years old. She had anounced to the boy and to about 50 strangers that he was stupid. How humiliating. I wish he could have realized that he was not the one we all thought was below average intelligence. I fully understand getting frustrated with your kids. At Disney Michelle asked me 67,000 times what we were doing next. I did get a bit tired of outlining our every move. But homegirl was excited! She wanted to know the plan. And when I’d be ready to limit her questions to 25 per hour, I thought, one day you’re gonna miss these inquiries. Oh, and I also thought, I’m glad I’m not an elementary school teacher. Yea, kids are frustrating – they can drive you nuts at times. But good grief, we brought them into this world. It’s our job to answer those questions, to help them learn how to keep up with their coat and to love the heck out of them even when they don’t. We are a Disney family – my parents are Disney fans and my in-laws are Disney fans. Lisa was the worst however, dedicated to the mouse in a deep fanatical sort of way. Her absence in planning was painfully obvious this year. With Lisa: A spreadsheet with crowd level predictions; at the door when the park gates open; a strategic plan for “fast passing” the most popular attractions. Without Lisa: Stroll into the park at 10; hope you get to ride something. With Lisa: The dining plan purchased along with our tickets; reservations for almost all of our meals; eating at off times from the crowd so we could maximize our ride times while they all stood in line for food. Without Lisa: Pretzels, soda and ice cream at a rolling cart at noon. With Lisa: A spreadsheet with parade times and shows; reserved front row seats for all; autograph books for character signatures; Princess breakfast for our gaggle of girls; tour of the park that climaxes with a personal meeting with Tinker Bell and Peter Pan. Without Lisa: Saw the top of parade floats behind the massive crowd; Princesses? Are there Princesses at Disney? With Lisa: A short boat or monorail ride to the park. Without Lisa: Drive the family van from the hotel, wait in line, walk two miles to the park and pay $10. With Lisa: Each child has time to shop alone with mom to pick out the perfect souvenir to remember our trip; a Christmas ornament for posterity. The wonderful thing about our family is that even without the organization, even without seeing a half of the attractions, even without going into one Disney World store, we still had an incredible time! a place I’d looked 100 times before this year. There are a number of bags up there with Lisa’s stuff in them. I had never been compelled to open them, but one in particular caught my eye that afternoon. For some reason, I reached up. When I opened it, I saw a Mickey Mouse dressed in a Santa suit. I smiled remembering our family vacation trip last December between Lisa’s treatment and surgery. 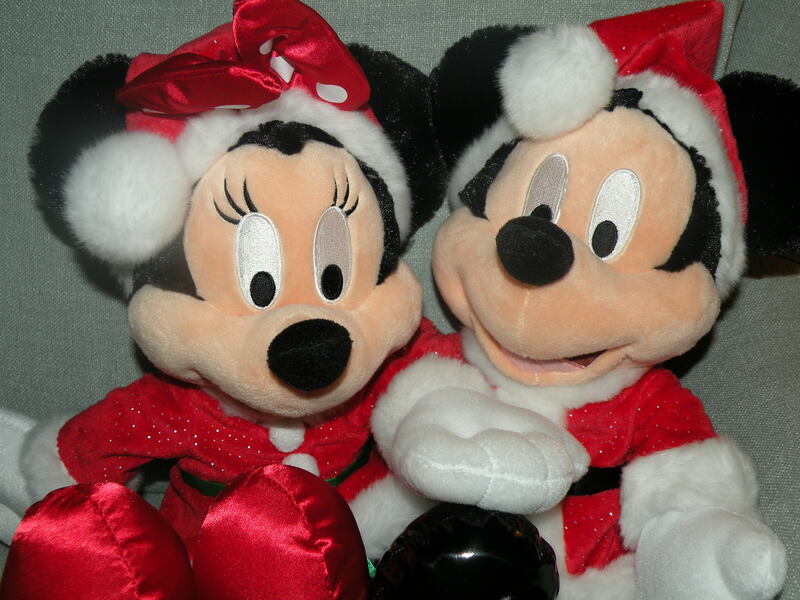 Stephanie bought a Minnie dressed as Mrs. Santa and Lisa said, “I hate to have a Minnie without a matching Mickey.” My response, “We don’t need any more frickin’ stuffed animals!” Apparently she purchased it to give to a kid at a later date. Isn’t it interesting that I opened that bag on Christmas Eve? I wrapped it for the girls from mom. If ever there was a doubting Thomas, it is I. I like to touch, see, feel, and smell before I trust or believe. I can almost hear Lisa defending me up in heaven. “He really didn’t mean that. I know, I know God but he really is a good guy. Let me go down there and give him a sign; maybe that’ll rattle him. Sometimes I think that the signs are here for true hope and faith. Sometimes I’m just too stupid to see them.